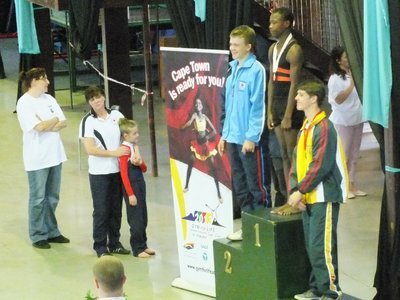 The big annual trip for our gymnasts was to South African Gymnastics Games in Pretoria. It is was a reward for commitment to our programme all year. 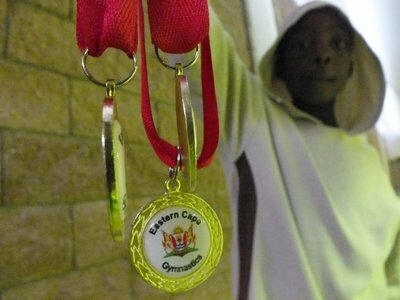 Nine gymnasts were selected for the Eastern Cape team to participate in the competition, but two of them didn't meet our high standards for commitment and had to stay home. 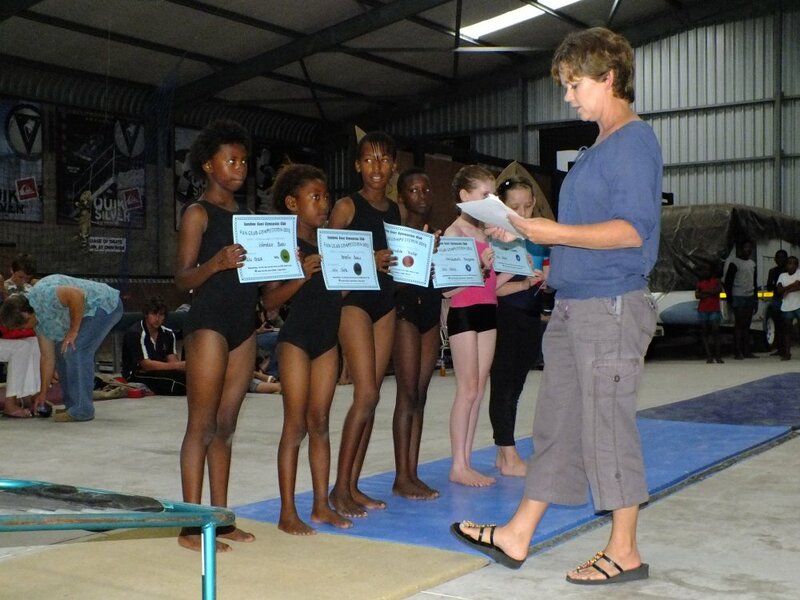 Five of our most committed gymnasts, who didn't make the Eastern Cape team,joined the trip. Preparation for the competition was a challenge. 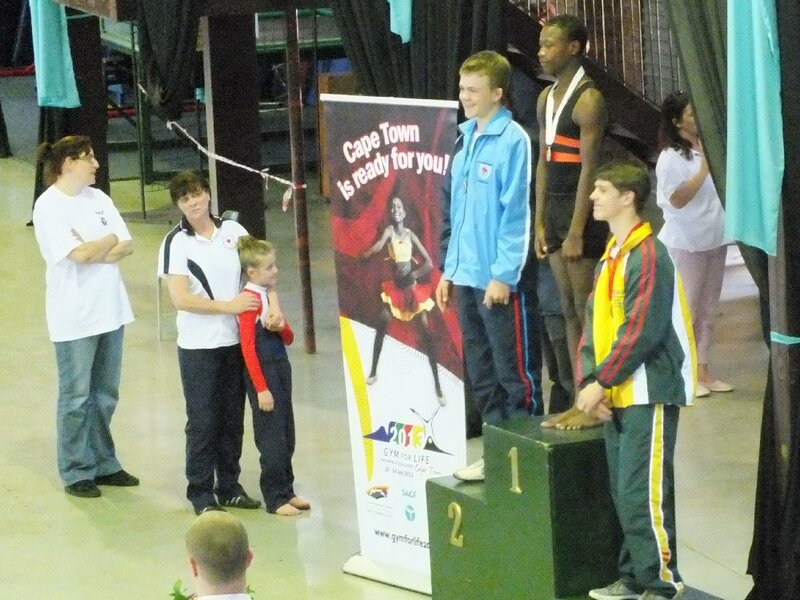 This year SA Games was only on the top level trampolines: the double mini trampoline and the euro trampoline. Our second hand double mini trampoline broke and we don't have a euro trampoline.We could only train on our blacktop trampoline for beginners. That preparation was unfortunately not good enough to win medals for trampolining. We also don't have a tumbling track, In tumbling the gymnasts did surprisingly well with Bronze for Siphokuhle Nyoka in 11/12 level 2, Bronze for Liyema Nxopho in 11/12 level 4 and Gold for Siphamandla Baku in the 14 and over level 4. These results are amazing, keeping in mind that we don't have a tumbling track and our gymnasts are in knowledge and skills ahead of our coaches. 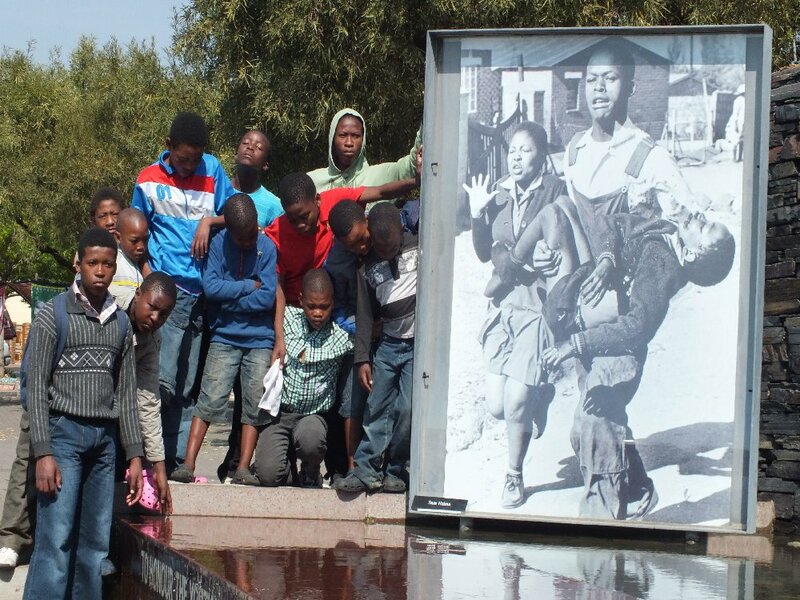 The trip is not only about competition, but also about exposure: experiencing that the world is bigger and more exciting than the township in Port Alfred. We went ice skating in Pretoria, visited the Pretoria zoo, Gold Reef City in Johannesburg, the Hector Pieterson Museum and Mandela House in Soweto, and more. Many thanks to Rhodes University for offering transport for the trip! 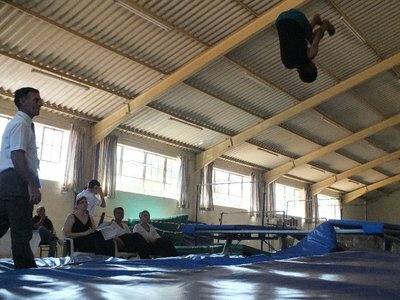 Mini-trampoline: Akhona Ngesi, Yonela Baku, Siphosethu Nazo, Lukhunyo Qhobosha, Nolubabalo Boosyen. 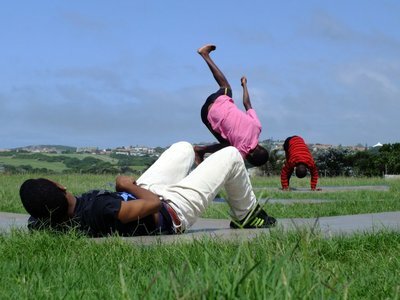 Blacktop trampoline: Akhona Ngesi, Siphosethu Nazo, Wandisa Baku, Lukhunyo Qhobosha, Nolubabalo Booysen. 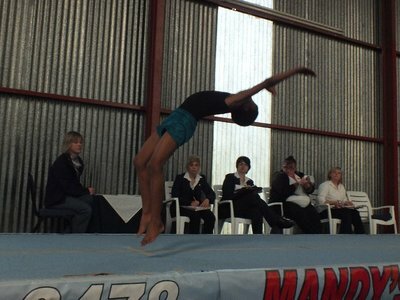 Elementary tumbling: Siphosethu Nazo, Yonela Baku. Double mini-trampoline: Ayamangalisa Nqomfo, Thando Ngoqo, Phelo Dasa, Siphokuhle Nyoka. 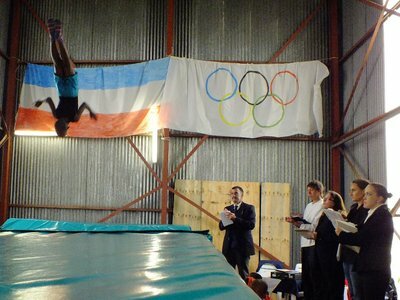 Euro trampoline: Ayamangalisa Nqomfo, Thando Ngoqo, Sinoyolo Qholoma, Lihle Nxopho, Siphamandla Baku. Levels tumbling: Lihle Nxopho, Simthembile Bari, Siphokuhle Nyoka , Liyema Nxopho, Siphamandla Baku. 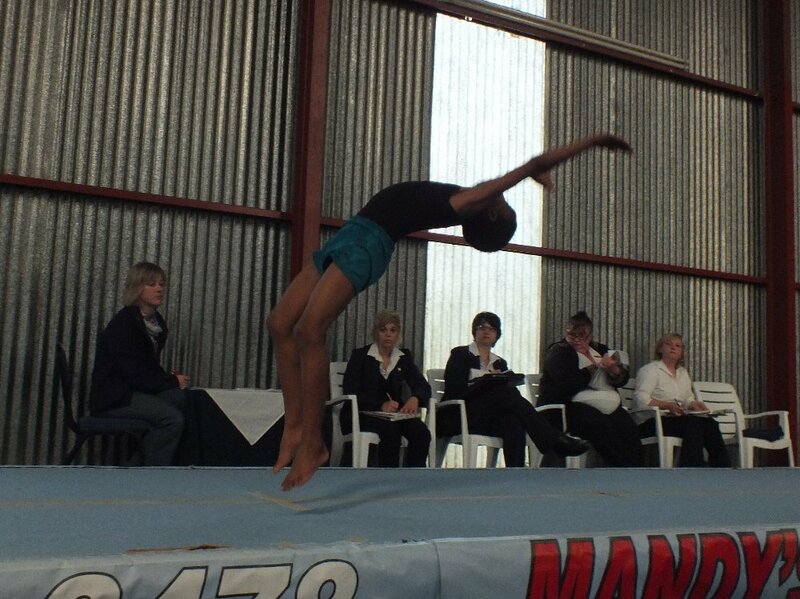 We are just back from the Eastern Cape Gymnastics Trials in Port Elizabeth, the first provincial competition of the season. 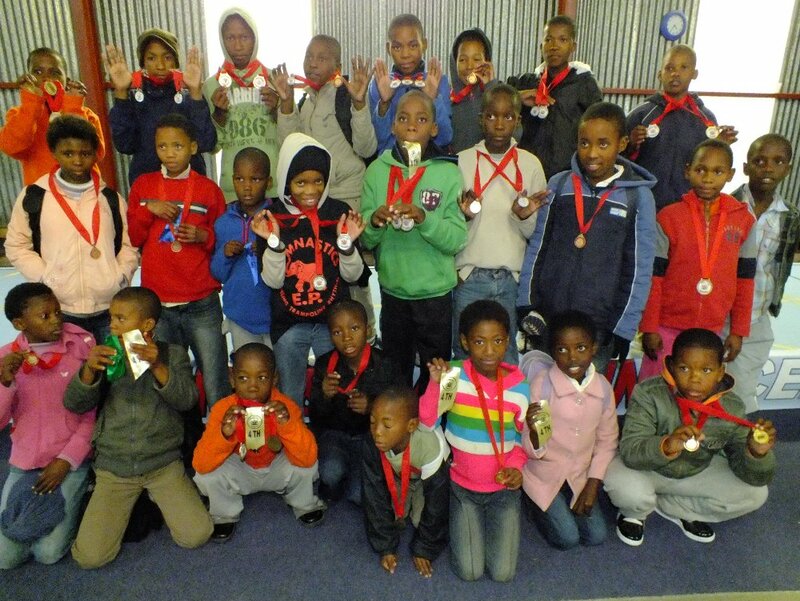 With a record number of 25 gymnasts, we returned from the two days event with a large number of medals (sorry we lost count!) It was a great event with participants at all levels, from beginners all the way to Olympic level, with some of the world's best trampolining and tumbling on display. A couple of our gymnasts were invited for the Eastern Cape Squad training in Port Elizabeth. It is great to train on a tumbling track and a real trampoline, we don't have those apparatus. 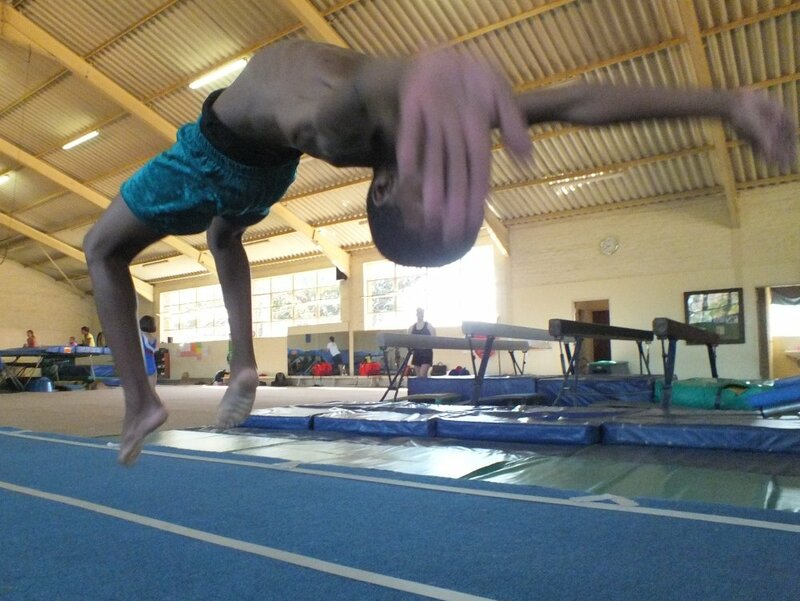 Being invited for the squad trials is a great honour, it means they see potential for international level gymnastics. 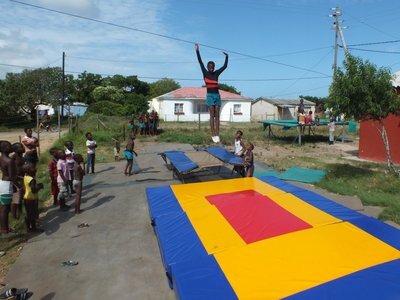 The Sunshine Coat Gymnastics Club in Port Alfred organised a small trampolining competition on the mini trampoline. Our guys were doing really well and won everything. We are preparing for Gym for All competition. 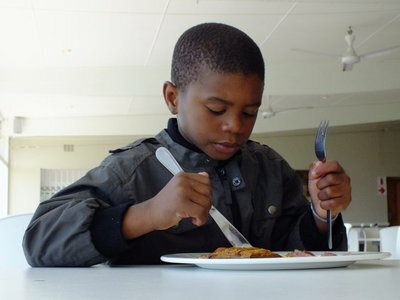 To make some good progress we organised a training weekend at Stenden University in Port Alfred. It went well and the food was nice but a bit strange. Training has started for the new year. We received new landing mats from the Department of Sport. Very helpful as our old landing mats are falling apart from intensive use and weather. It is not good for the equipment to do gymnastics outdoors. Our level of gymnastics is too high for our equipment. We have a good quality black top trampoline, but that is a beginners level trampoline. We don't have a eurotramp to further progress with our experienced gymnasts. Our double mini trampoline is for experienced gymnasts, but second hand and not in a good condition. 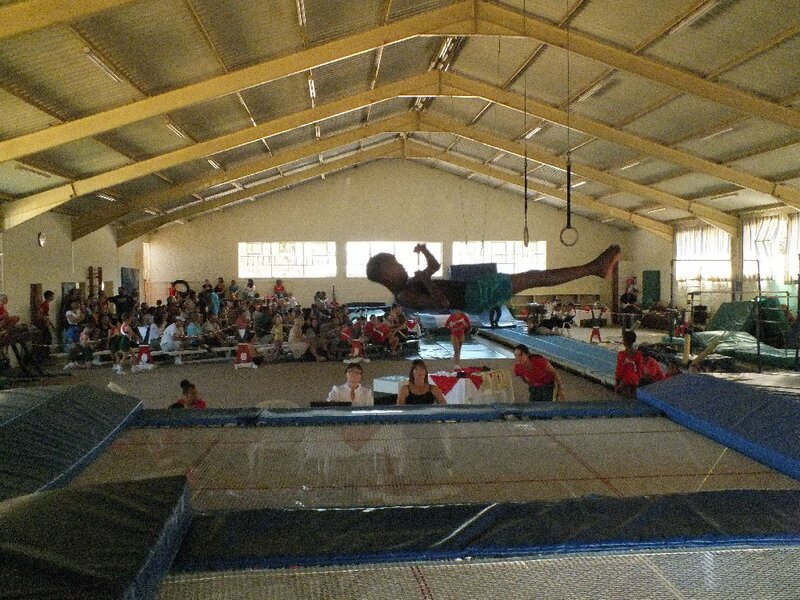 We don't have a tumbling track, what makes it difficult to progress beyond beginners level. 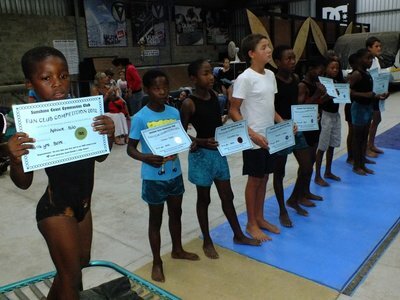 We hope to find funding for a gymnastics hall and good equipment. 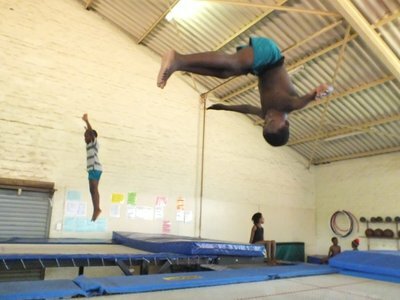 So long we'll have to make the best out of the limited facilities we can offer our gymnasts.